The solution initially seems simple, implement Demand Driven MRP (DDMRP). By strategically placing inventory at de-coupling points, we create independence between supply and demand (reducing variability), decoupling lead-time (further reducing variability and decreasing cumulative lead-time variability). This is a barrier for many of us in taking the demand driven leap and the large-scale proliferation of the methodology it so deserves, particularly in constrained or complex manufacturing environments. The big concern is just how it will all fit together in our complex networks, and specifically how we can marry or align our short-term replenishment activities with our Sales & Operations Planning (S&OP) processes. This is where the Demand Driven Adaptive Enterprise (DDAE) comes into play. DDAE consists of Demand Driven MRP, Demand Driven S&OP and Adaptive S&OP. Each process considers different horizons (operational, tactical and strategic) and is executed independently of each other, but crucially, there are feedback loops between the processes to define the critical parameters. This creates an over-arching planning framework which can leverage the power of DDMRP, whilst providing the visibility and management of longer term activities to drive a greater ROI. Within this framework the Operating Model - DDMRP (deciding what materials or production orders to release today), the tactical S&OP activity (anticipating the constraints of the mid-term planning period) and the long-term strategic business planning processes work in harmony together in a well-choreographed routine. 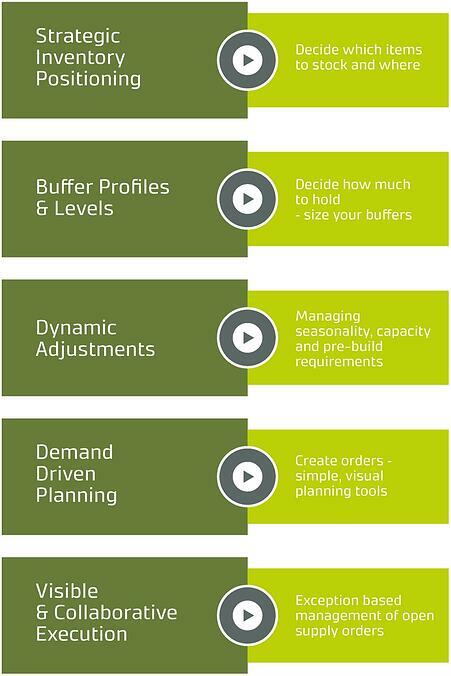 In this new and better world, the forecasts and constraints identified in the S&OP processes will influence the daily Operating Model activities through the Model Configuration capabilities of buffer sizing, not define them. Expressed differently, the output of our inherently flawed S&OP process is no longer a master production schedule, but a projection of buffer sizes and adjustment from which replenishment can be driven. The solution developed by Olivehorse allows us to leverage the benefits of the Demand Driven Operating model using Demand Driven Technologies Replenishment+® as the tool of choice. This provides a simple, visual, focussed solution ideal for driving replenishment, whilst at the same time, with our Demand Driven APO solution we can exploit the power of APO to manage our DD S&OP process. One key benefit of our solution, particularly important for those managing supply chains which are complex from a capability or geographical perspective, is that it can be implemented across regional or global supply networks, with forecast driven and demand driven data co-existing in a single planning view. The core of the Demand Driven APO solution is the ability to create a buffer projection which drives constrained and unconstrained SNP planning using existing APO capabilities such as optimisers, max stock, shelf-life planning, fair share planning, group planning etc. The visualisation of the required buffers into the future allows us to identify where we see excessive buffer penetration and calculates a recommendation of the buffer adjustment required. When applied to the 5 steps of DDMRP we can see that APO is now providing us the crucial (but previously difficult to manage) Dynamic Adjustment functionality. When we look to the future, the capability we can now deliver in APO will become supercharged when deployed to IBP. Suddenly the possibilities for optimising, assigning and reviewing buffers and buffer profiles opens up far beyond our current reach. To learn more about our DDAPO functionality and how it integrates with R+ to provide a demand driven solution, or to schedule a demo of our solution, please get in touch.